With a classic Shaker style that is versatile enough to work in any type of bedroom decor, and a headboard storage solution that can hold anything, it's no wonder our Lancaster Bookcase Captains Bed is one of our best sellers. Crafted from solid hardwood by the skilled hands of Amish artisans, this captain's bed is worthy of becoming your next family heirloom. Inspired by a mix of Old World styles, this beautiful bed features a deep bookcase headboard, topped with a large shelf, crown molding all around, and thick legs to provide a firm base. Here, you'll have room for any bedroom items you'll need to make your evening seamless. 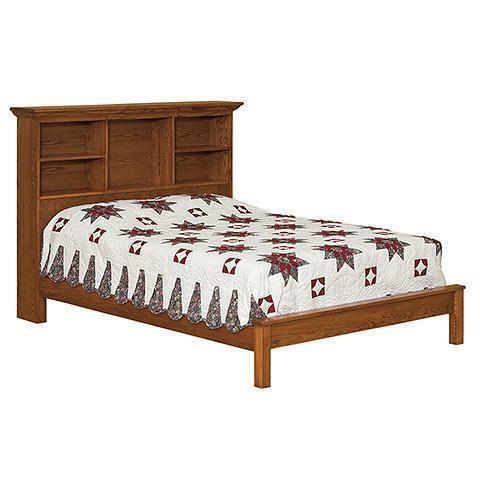 Connecting the headboard to the clean-lined low footboard are two solid wood side rails. Combining them are a series of wooden slat supports that are anchored to the bed with dovetails inside of a metal base - all of which equal a lifetime of stability for your mattress and box spring. Customizing the captain's bed is easy - giving you a variety of different ways to incorporate this wonderful centerpiece into any suite. Choose the size, wood, and finish to complement your decor and let us build the perfect bed, just for you. Headboard Depth - 12 1/2"
Bookcase Depth - 9 1/2"